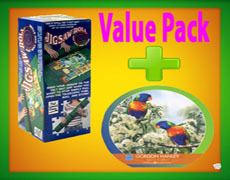 North American made and founded in 2005 with a desire to bring quality puzzles with a loving, whimsical, nostalgic feel to jigsaw puzzle enthusiasts around the world! This puzzle companies' most popular piece count is the 1000 piece puzzle. However, they also manufacture 60 piece kids puzzles to adult puzzles with 2000 pieces. Their puzzles are classified as "Easy Handling Puzzles" (275 large pieces) and "Family Puzzles" (400 small, medium, and large sized pieces) Cobble Hill Puzzles are a random cut puzzle using custom made puzzle dies making for a more interesting and fun experience, as you never quite know how they are going to fit together.